For those who would like to do a weekend retreat but can’t make my three day April Spring Renewal Retreat here in Nashville, I will be leading a weekend retreat in the North Georgia Mountains. The lodge is right next to a National Forest, about 4 1/2 hours from Nashville. 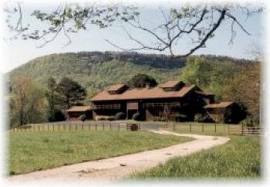 Please join us in the beautiful North Georgia Mountains for a weekend of sitting and walking meditation. During this silent retreat, we will cultivate what the Buddha called “the immeasurable states of heart and mind” – the Brahma Viharas or Divine Abodes. These are the qualities of love, compassion, joy and equanimity that reside in us all. Our innate lovingkindness will be strengthened and enhanced by sitting and walking practice, discussions and dharma talks. As our hearts awaken, we can discover a deeper sense of openness and interconnection with all of life. This residential 4-day/3-night retreat is recommended for both beginning and experienced meditators. Sautee Lodge is located in the north Georgia Mountains, surrounded by a national forest. The retreat will begin Thursday evening and close at noon on Sunday. Cost is $150 plus dana (donation) to the teacher. Lisa Ernst is the founder and guiding teacher at One Dharma Nashville. She began meditation practice in the late ’80’s in the Zen Buddhist tradition. Lisa has also studied and practiced in the Theravada tradition since the late 90’s. She has been teaching since 2005 and was given full dharma transmission from Trudy Goodman in 2010 in the lineage of the Thai Forest tradition of Ajahn Chah. For more information or to register, go to here. This entry was posted in Retreats and Events and tagged Georgia, Lisa Ernst, lovingkindness, Meditation, meditation retreat, metta, Metta Retreat, One Dharma Nashville Retreat, Red Clay Sangha, Retreat, Tennessee, Vipassana, Zen by Lyn. Bookmark the permalink. I tweeted this. I know you cannot control what Google adsense puts up on your blog. Thought it interesting that your retreat post was followed by the controversial Tiger Woods video….Happy spring! Thank you Leisa, for helping get the word out.